I had the distinct pleasure of spending much of last week with 80 amazingly bright and talented Koch Summer Fellows. We bonded over the art of interviewing. For most, interviewing conjures the same excitement as a root canal or watching a movie marathon on Lifetime. But the Koch Summer Fellows made interviewing an absolute delight. We went through dozens of mock interviews and lots of discussion about what makes for a good interview. Bring Your A-Game Handshake: Come with a solid handshake – strong, no knuckle grinding or sweaty palms, and remember eye contact. No Sailor Talk: No matter how comfortable you feel with the person interviewing you, do not let curse words fly. No #$%*. Wear the Suit: Unless you’ve been told otherwise by the organization, it’s probably best to wear a suit. Worst-case scenario: you’re overdressed. Best-case scenario: you get the job. 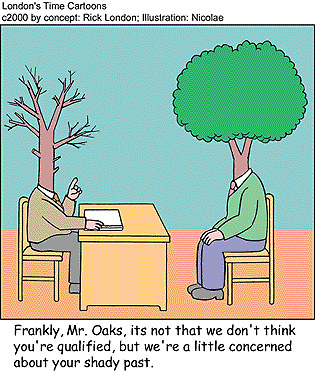 Less Is More: Be careful that your answers to the interviewer’s questions don’t turn into soliloquies. If you (or the interviewer!) have forgotten what the question was midway through your answer, you’ve gone on too long. Make It a Disney Story: If your interviewer asks behavior-based interviewing questions (Tell me about a time when …..Give me an example of…Describe a time when…), make sure to share positive stories from your past. Avoid sharing situations that may reflect poorly on you or be misconstrued by the interviewer. Show Me the Money: Be ready to discuss salary. Have a range in mind and be confident when you say it. Take Out the Trash: Don’t trash your former employer. Even if your former boss engages in felonious behavior, be careful about how you frame the situation. Riddle Me This: Come with questions. If the interviewer asks if you have any questions and all you have is crickets, you’re in trouble. If you draw a blank, a question about organizational culture is usually a winner. Thanks to all the 2012 Koch Summer Fellows for a wonderful week. I feel much better about our future knowing you guys are the next generation of freedom fighters.